Please note: This post was created in partnership with Christmas Tree Shops® andThat!. All opinions and content are my own. Thank you for supporting brands that support this site! The weather seems to be inching farther and farther away from a never-ending winter, and closer each day to the promise of summer parties and al fresco dining! Eating dinner outdoors has to be the number one warm-weather activity I look forward to as the seasons change. 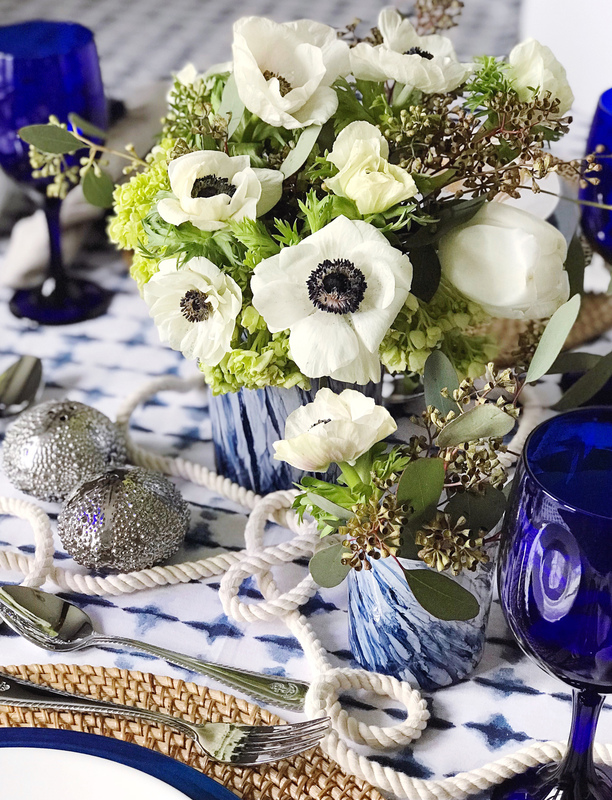 Living so close to the ocean, combined with my affinity for all things nautical and preppy, I more often than not like to give my outdoor table a festive sea-inspired spin when I’m hosting guests. I was so excited to hear that Coastal Living Magazine was designing a line of affordable home products in collaboration with Christmas Tree Shops® andThat! and jumped at the chance to style some of these new pieces in a summer vacation-worthy tablescape! 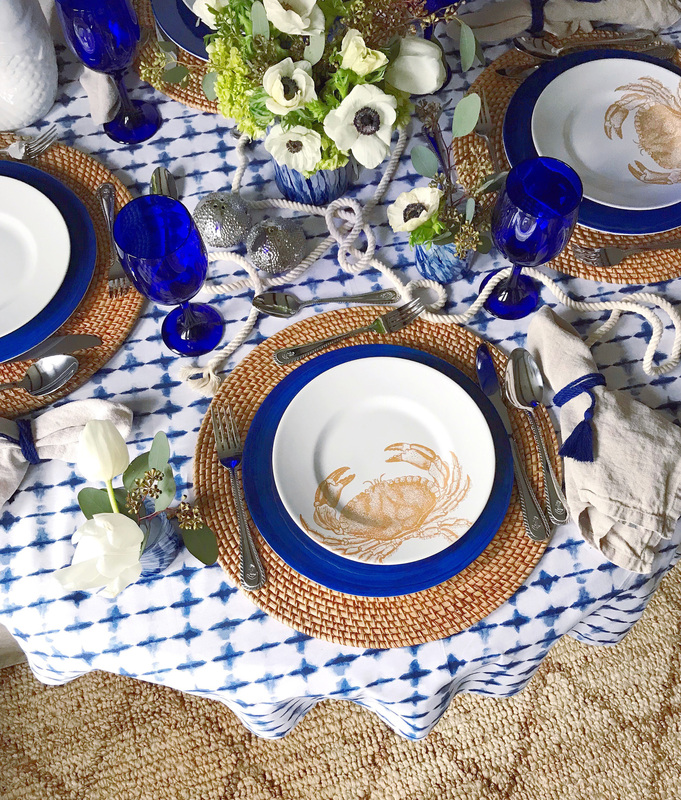 I thought I’d share a little bit about how I pulled the look together with pieces from the Coastal Living® Seascapes line and how to steal some of these tricks for your own summer entertaining décor! I started my table design with one of my all-time favorite styling tricks! 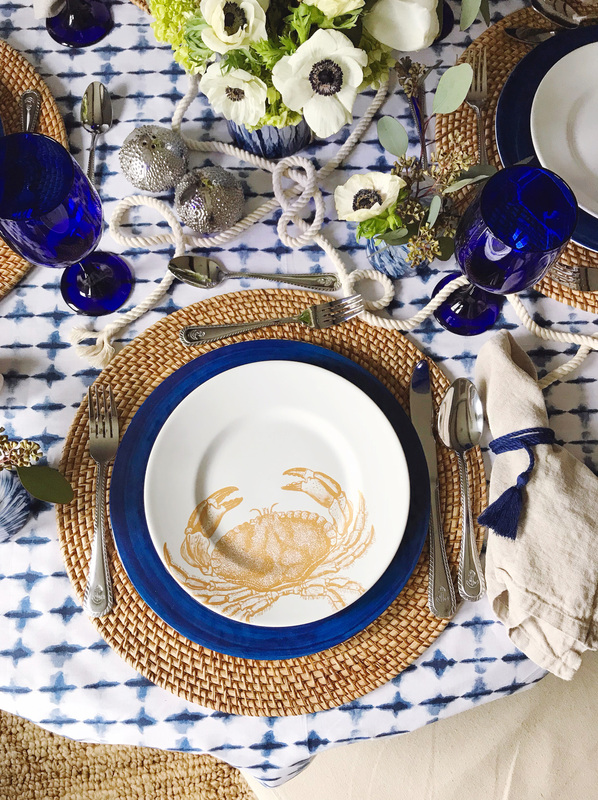 The beautiful blue and white shibori print tablecloth you see in these pictures is actually a flat full-size bed sheet from the Coastal Living® Seascapes line. Whether you’re trying to accommodate a long outdoor picnic table, or work a specific color scheme into your dining room, a big flat sheet can be an easy and affordable alternative to formal table linens. The best part is there are so many more pattern options for sheets, like this indigo-dye print from the collection. 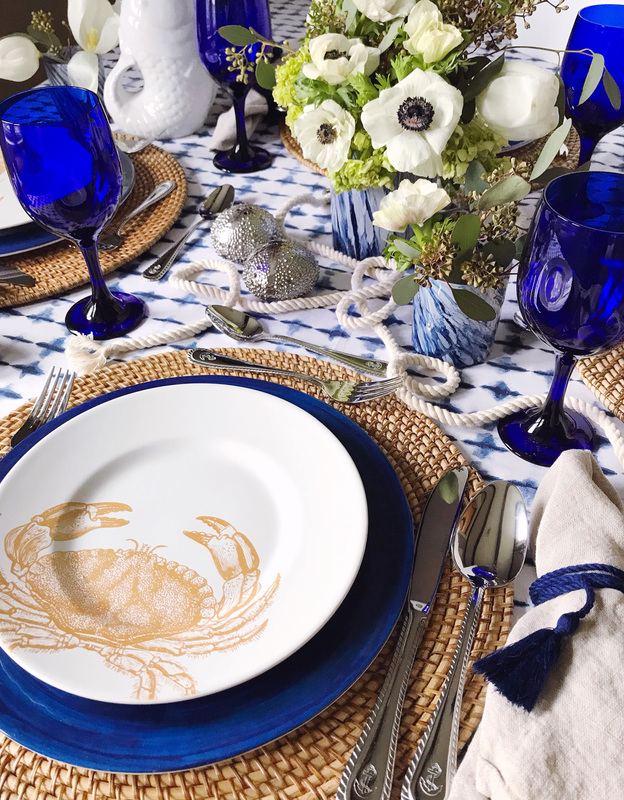 The next pieces that inspired my blue and white nautical tablescape were the plates! 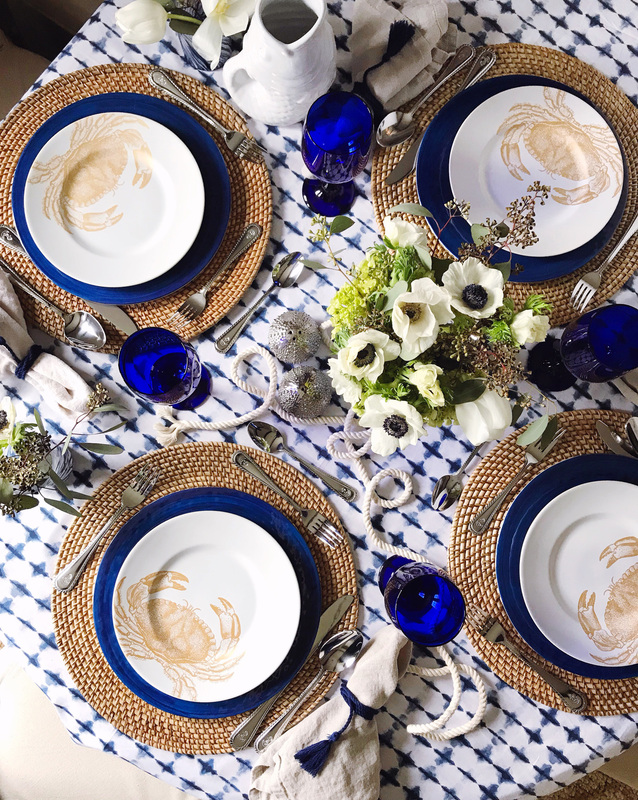 I found some simple blue melamine plates to rest behind a set of the Coastal Living® Seascapes gold crab plates – the print is subtly nautical without being too theme-y, which I love! I brought in more of the deep blue tones with a set of cobalt wine glasses. I got so excited when I saw these in the store because they reminded me so much of glasses from a beach vacation home I stayed in as a kid – they scream summer to me. For one more nautical touch on the table, I found a flatware set at Christmas Tree Shops® andThat! with rope and anchor detailing – they were perfect for this look! 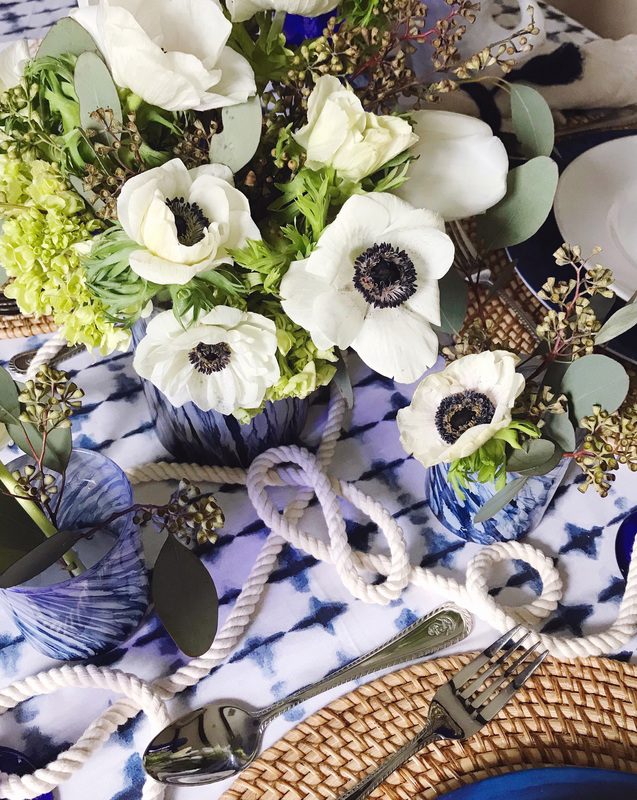 For some festive elements to finish off the table, I used some navy tassels and string to hold casual linen napkins that I use for summer entertaining and a big white cod pitcher from the Coastal Living® Seascapes line was set on the table to hold lemon water. I also used a few of the glass tea light and candle holders from the collection– with a really interesting blue marbled wave design – as small vases for some fresh white flowers. 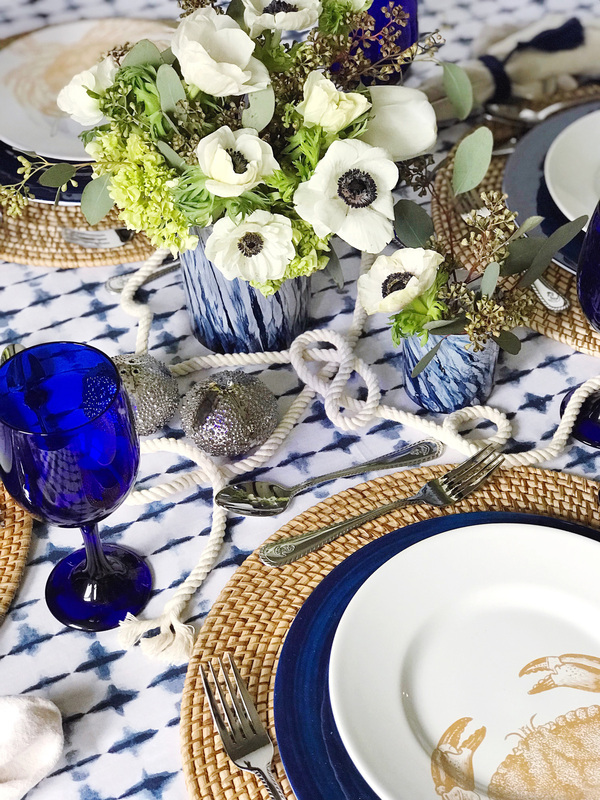 A little bit of nautical rope was woven around the table to tie it all together! I’m so happy with how the look came out because few things make me happier than preppy, blue and white, nautical vibes – and it was all so incredibly affordable: bonus! Make sure to check out the rest of the Coastal Living®Seascapes if you get a chance – there is patio furniture, outdoor cushions and rugs, and decor (I’m eyeing some fun havana leaf print pieces!). Here’s hoping there will be lots more summer entertaining in my future! 4 Responses to "A Nautical-Inspired Table." love it ..so pretty and fresh.. This has me dreaming of summer! It is such a pretty tablescape, Kate! The flowers are stunning! Also great idea about using the sheet!